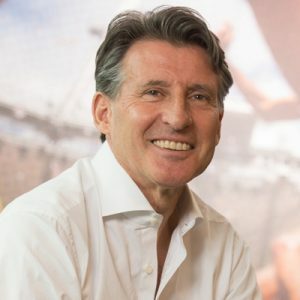 Lord Coe is the President of the International Association of Athletics Federations (IAAF) and the Executive Chairman of CSM Sport & Entertainment. As an athlete he won Olympic gold medals in the 1500 metres in 1980 and 1984 and set 12 middle-distance world records. He went on become the Member of Parliament for Falmouth and Camborne and later chaired the London Organising Committee of the Olympic and Paralympic Games (LOCOG). Sebastian Coe was born in London in 1956 and then his family moved to Sheffield. It was there that he joined the athletics team at Hallamshire Harriers, specialising in middle distance events. On leaving school, Coe studied Economics and Social History at Loughborough University and in 1977 made his first mark as athlete, winning the 800m at the European Indoor Championship. The following year he set a new United Kingdom 800m record and in 1979 he broke the 800m, 1500m and mile world records in the space of 41 days. At the Olympic Games in Moscow in 1980, Coe won the gold medal in the 1500m, having won silver in the 800m. Four years later in Los Angeles he also won silver in the 800m before becoming the only man to successfully defend the 1500m title. Coe retired from athletics in 1990 and two years later was elected as Member of Parliament for Falmouth and Camborne, a seat he held until 1997, when he became Private Secretary to William Hague, the Leader of the Opposition. In 2000 he was appointed a life peer and took the title of Lord Coe of Ranmore. In 2004 Coe took over as Chairman of the London bid to host the 2012 Olympic and Paralympic Games. London was appointed as host city in July 2005 and Coe chaired LOCOG, which successfully delivered the Games in the summer of 2012. Following the London Games Coe became Chairman of the British Olympic Association and Executive Chairman of CSM Sport & Entertainment. He was elected President of the IAAF in 2015, having been a Vice President since 2007. Coe, who is married and has four children, has received numerous honours throughout his career. He was the BBC’s sports personality of the year in 1979 and in 1982 he was appointed a Member of the Order of the British Empire (MBE). Eight years later he was promoted to Officer of the same order (OBE). Following his appointment as a life peer, Coe was promoted to Knight Commander of the Order of the British Empire (KBE) for his services to sport and in the 2013 New Year’s Honours List he was appointed to the Order of the Companions of Honour (CH).